Cheviot Hills is one of the best areas to live on the westside (granted, I’m biased, because I chose to live here). That said, I watch this area very closely and here are my observations. 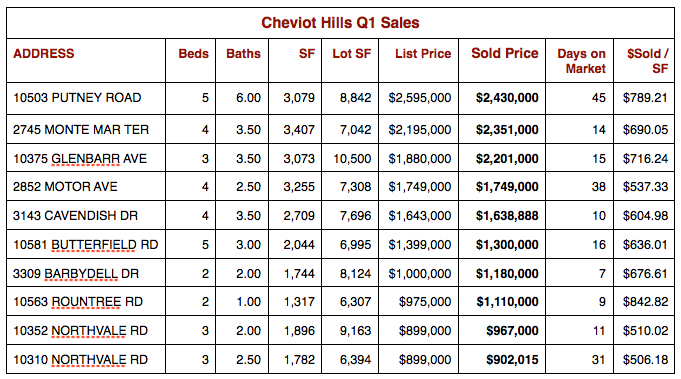 Cheviot Hills 1st Quarter Prices Kick Serious A$$! Yes, that’s an unprofessional headline, but I’m quite enthusiastic about the direction of Cheviot prices (and other stats) for the first quarter of 2013 (that’s January through March for those of you who prefer to measure markets using pennies, nickels or dimes). Here’s what I’m thinking that you should be thinking: If you are thinking of selling your home, we have a great selling climate — low interest rates are mixing with low inventory, and very high buyer demand. Homes are selling in multiple offers, and even off market sales are selling at very high prices. Yes, it is possible that the market can keep going up, but if the number of homes for sales increases, the market momentum could stall. Plus, with so few homes on the market, it’s easy to make your home stand out (especially if it’s priced below $1,750,000). Okay, you know the drill. If you are thinking of selling, give Chad and me a call. We’ll give you a free evaluation of your home (and a free notepad… maybe even two notepads). Look back at the end of the week to see our video update on the market. What’s happening with housing prices? They are going up, that’s what. CNN Money reported that we are seeing the biggest spike in home prices since the bubble (here’s the article: http://money.cnn.com/2013/03/26/news/economy/housing-recovery/index.html?section=money_realestate). To be fair, CNN calls it the “Biggest home price rise,” but if you’ve read anything that I’ve written of late, I prefer to call it a spike because I think it’s a situational rise brought on by two things: low (or no) inventory and low interest rates. Yes it is possible that the market may go up more in the near future, but it’s also possible it won’t. As sellers “catch on” and more inventory comes on the market, buyers will feel that they have more choices, demand will decrease and prices will begin to settle (or even, gasp, retreat). Buyer, seller, economist or palm reading psychic, call me and let’s talk! 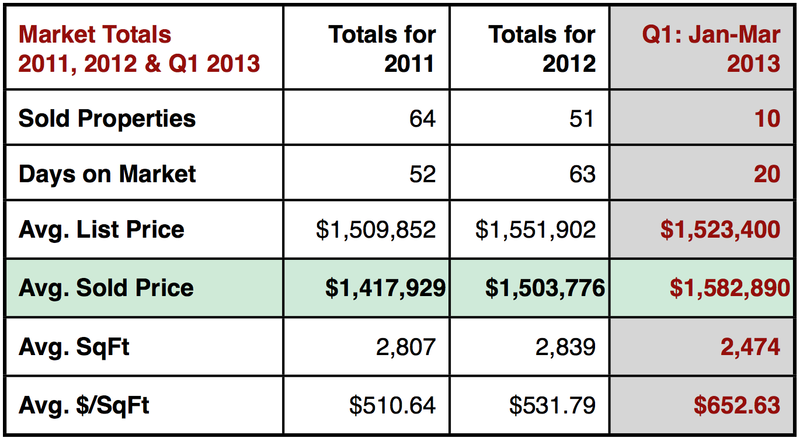 The first quarter numbers are in, and Cheviot Hills is holding its own compared to the same quarter in 2011. If you don’t believe me, watch the exciting and action packed video and learn all about average days on market, average prices, and the average $/Square Foot. Plus, if you act now, you’ll learn my secrets of winning the lottery.